Two weeks ago we quoted David Hunt, CEO of $1.2 trillion asset manager PGIM, who said the real financial timebomb was and remains public pensions: "if you were going to look for what’s the possible real crack in the financial architecture for the next crisis, rather than looking in the rearview mirror, pension funds would be on our list." 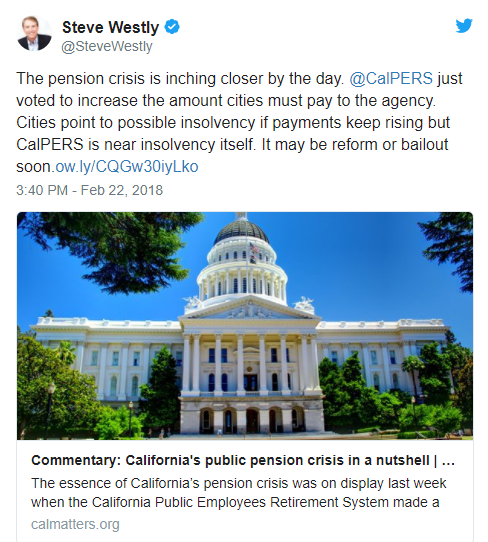 Westly was referring to an editorial laying out "the essence" of California’s pension crisis, exposed last week when the $350 billion California Public Employees Retirement System (CalPERS) made a "relatively small change" in its amortization policy. Officials fear that were it to experience another big investment loss, CalPERS would pass a point of no return and never be able to pay for pension promises. When the crisis really hits, it will be all American taxpayers who are on the hook to bail out the country's insolvent pension funds. It is also then that some of the deepest fissures in US society: between public and private workers, between taxpayers and benefits recipients, between the young and old, all bubble to the surface at the same time, with very violent consequences.